News - Madonna slams Gaga in new song? Madonna slams Gaga in new song? 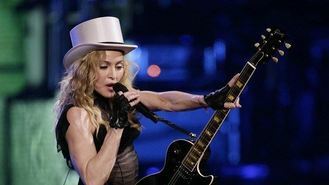 The 56-year-old Queen of Pop - who is working on her 13th solo album - has been locked in an ongoing feud with Gaga for several years following claims that the 28-year-old singer plagiarised Madonna's music. Now The Sun has reported Madonna has been working on a track called Two Steps Behind Me, and the leaked song includes the lyrics "You're a copycat, where is my royalty?" Lady Gaga has always said that she had been a fan of Madonna and taken inspiration from her, but the pair appeared to fall out when Madonna began to comment on what she said were similarities between her hit Express Yourself and Gaga's Born This Way. And Gaga hit back in an interview last year: "I think she's more aggravated that I'm not upset that she doesn't like me... I don't want your f**king throne, no thanks, I have my own."